dimensions : 67 H x 31,5 W x 29 D cm. 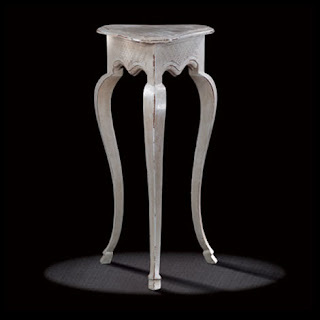 Small French Regency pedestal table with three legs ending in shoes. The special shape harks back to the animal style of Ancient Greek mythology, portraying fauns or the Galatea goat. The symmetrical decoration is inspired by figures in vogue in the first thirty years or so of the 18th century. It is used a great deal when on its creation this light piece of furniture was intended to carry candelabra and girandoles. Antique Pedestal table : in the beginning the pedestal table was shaped as a Moor, a slave carrying a tray. The central trunk was then embellished with a tripod and various models of it were available. The candelabra may also be confused with pedestal tables depending on the artists.